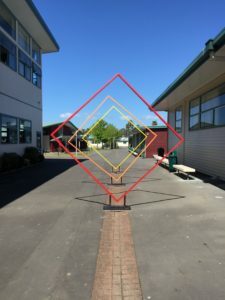 For someone who has always been fascinated by the play of light and explaining shape through light, it came as a huge surprise that her sculptural interpretation of white light being broken into colour — had got her noticed in Wellington. Cassandra Ter Weijden, former student of Pakuranga College couldn’t believe her eyes when she read an email saying her art portfolio had achieved Excellence in the Visual Art and that she was one of the 30 students in New Zealand whose art work was selected to be featured in The Top Art Folio Exhibition–an annual touring exhibition featuring a selection of the NCEA Level 3 portfolios. The five streams covered are design, painting, photography, printmaking and sculpture. Cassandra’s art will travel across schools and museums around the country. 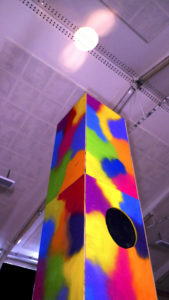 Her work comprises of a tall tower— that plays with light, shape and colour. 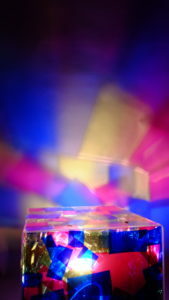 “Every sculpture was individual with manipulation of colour, light, shadow, giving it an artsy and analytical meaning. “The idea of the artwork is that colour represents positivity; while the different shapes and use of light show that positivity can appear in different forms,” she says. The 17-year-old University of Auckland student is currently doing a Bachelor of Arts in criminology and psychology. Giving due credit to her teacher Frank Woodward, head of visual arts she says, “He helped me heaps with research. Also, I was not used to using power tools and by the end of the year I was skilled at using saw drills and tools that I never thought I would need to use. Woodward says, he has worked with Cassie for a few years and is really pleased that she has been rewarded for her hard work with representation in The Top Art Folio Exhibition. “Sculpture requires experimentation with ideas and materials, pushing boundaries through interesting and unusual combinations of the two,” he says. “Cassie approached the challenge of this in her Year 13 Sculpture folio with excess energy and determination.